Val is telepathic and intuitively guided by your Innate Body Mind Wisdom.This means she can hear animals and they can hear her. She doesn’t have to be in the room with them or touch/control them in any way. She works over the telephone (usually with a picture of the animal for focus) and is helpful with behavior and training, performance issues, health situations and euthanasia decisions. She works with all types of companion animals as well as performance/professional animals. She can help you better understand each other and work towards resolving issue(s). She easily works with more than one animal during a session, and doesn’t charge by the animal, only for her time. She specializes in “what’s next” which many animal communicators do not (sometimes they only tell you what you already know!). And depending on what’s needed, she can also do energetic healing, counseling, negotiating or identify what other modalities are needed. She’s always felt that talking with our animal companions is the first step, but that what’s really needed and wanted (by you and your animal!) is how to best resolve the problem, whatever it is. So depending on what your animal(s) has to tell us, we will be most able to make rapid progress. It is very difficult to lose a person from your life, and the same is true of losing our animal friends. Many people feel like their much loved animal friend is a true family member. Val respects this bond between a person and their animal friend and how it can be a very difficult time when an animal friend passes on. Our animal’s spirits do go on, and it is possible for Val to communicate with them. It can be very important to reconnect, ask the questions left on your heart, hear what they need to tell you in order for you to have closure and to help you find peace about what happened. It is sometimes appropriate to do a Closure Process to help you find peace and completion with what has happened. If you’d like to schedule a session, please Contact Val She can communicate with those who have passed on, and she also works with you to rebalance and find your peace with what has happened. 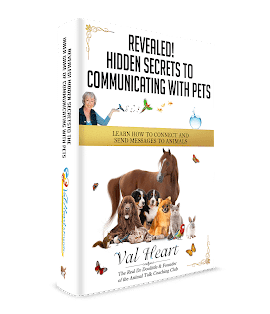 While you are waiting for your session, check out Val’s Free Classes & Animal Communication Workshops. They are designed to answer many of your questions, address the most common fundamental problems people have with their animals. They will also start your process of learning and expanding your connections with your animal friends, as well as teach you fundamental basics every animal lover needs to know. Just visit the CLASSES and WORKSHOPS pages! If you believe you match Val’s criteria, you’ll be asked to fill out Val’s Questionnaires, one for you (and one for each of your animals, as appropriate). If you want Val to work with your animals, you’ll be asked to give her pictures of them. Contact her to schedule your session appointment and pay for your session (due 48 hours prior to your session time). Please know that your session begins when you make your commitment to this process, and that things will begin to change for you .Many people also see change in their animals as well –that’s normal. It means that you and your animals are beginning to make the exciting fundamental changes necessary to realign you with your heart’s desire and goals. Val can’t tell you how long it will take, because answers to some of your questions are often simple, and others can get much more involved as we explore the issues, working towards resolution of a problem(s). She will do as much as possible in the allotted time, and can always reschedule to do the rest at another time. A good rule of thumb to follow is to allow a minimum of 30 minutes per animal or more, plus 30 minutes or more for your own process and rebalancing, taking into account the type of problem you (or they) are experiencing. Your scheduled appointment purchases her time. If you don’t show up foryour appointment, you still owe for her time. If you need to reschedule, please give her at least2 business days notice so that she can offer your time to someone else. No one can guarantee to make you or your animals change, that’s your job. However, Val does offer certain guarantees.CLICK HERE to review Val’s guarantees for her animaland people therapy. Self-care is an extremely important part of your healing process. The bottom line here is that you are in a constant state of change and flux, reacting and responding to the factors that stress/challenge you on multiple levels and dimensions. While you may immediately experience positive changes and results, you could also experience temporary difficulties as your body works on repairing itself. Symptoms may intensify for a short period before relief is felt, so don’t be alarmed if this happens – in fact, these symptoms tell us that BodyTalk is working, supporting the body as it makes changes, addressing problems more aggressively. It is important to be patient and gentle with yourself as you process and integrate these changes. If your body must create new neural pathways or generate new tissue or cells as it rebuilds healthier organs, joints, etc., this may take a few weeks or months, depending on the complexity of the task. If for any reason you are unable or unwilling to take the time you need to heal after a session, please tell Val. At least one parent or caregiver needs to be worked with first because of shared issues and family dynamics, (concept of mirroring). Animals need not be physically present for treatment. Val is happy to offer either in-person office visits or long-distance sessions. For long-distance sessions, she requires that you schedule a time when you are able to be in a quiet place, and she will work with you and/or your animal over the phone. Office hours are Tuesday through Saturday, 10 am to 4 pm. In person sessions are available by appointment only at her office located at 16607 Blanco Road, Suite 12105, San Antonio, TX 78232. Long-distance sessions are available at other times.